When it’s time for a relaxing break away from the office, is there anything better than taking your family into the countryside for some fresh air and the chance to be close to nature? Everyone will benefit the time you spend together, eating camp meals and bonding around a roaring campfire. But perhaps you have bad memories of camping trips from when you were a kid. Do you automatically think of badly-pitched tents and sleepless nights on cold, hard floors? But it doesn’t need to be like that. Here’s our guide to picking the best large family tents for more successful – and more comfortable group camping trips. 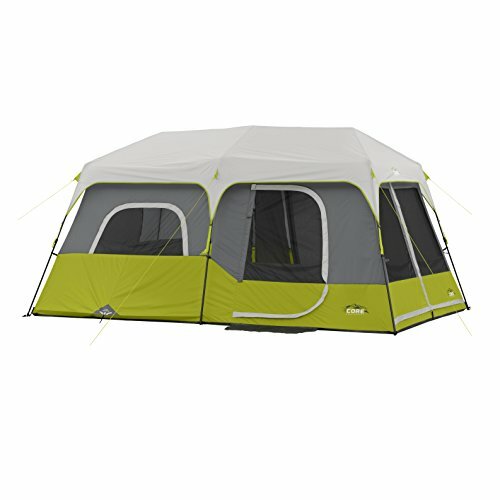 This is the ideal family tent for someone who wants plenty of space for comfort and storage. As a cabin-style tent, it is easy to move around inside, even for adults. This model performs well in warm conditions as well as in wind and rain. It is also a good option for a hunting tent. This Browning tent is free-standing and is constructed from fiberglass poles with steel uprights, making it strong and sturdy, even in wind. We like the extra height in the center, high enough for adults to move around freely. It sleeps eight but would be more spacious and comfortable for six. 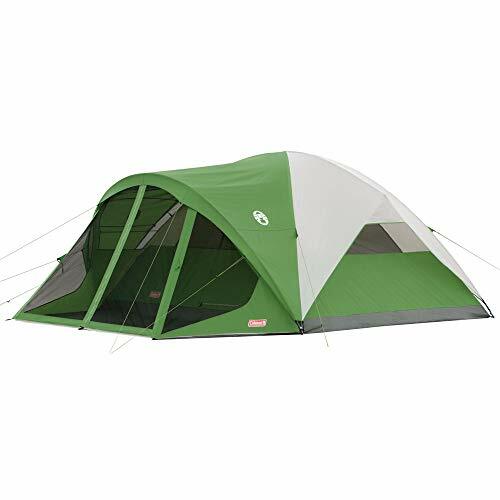 Another aspect we appreciate is the fact that the tent has two doors for easy access and six windows for extra ventilation, making this tent is suitable for warm-weather camping. On the other hand, it also performs well in poor weather. The included polyester fly gives extra protection. This tent is designed to be big and rugged, but this does mean that, at over 34lbs, it is not the lightest – it is perhaps less suitable for those who value mobility. It is not a four-season tent and so is not adapted to camping in extremes of cold. 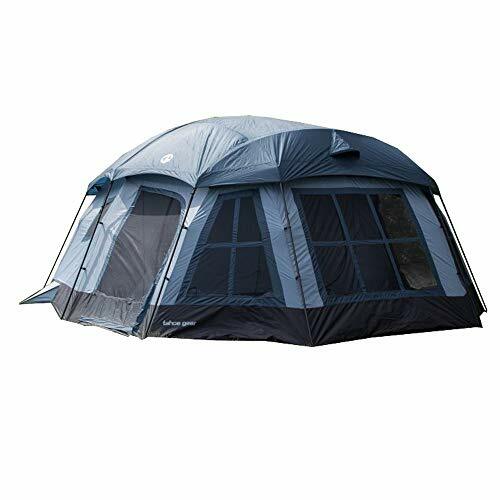 This model is a good option for someone looking for a family-sized tent that can comfortably accommodate up to six people or more who also wants the advantages of a dome tent. It is relatively lightweight, it is simple to set up and is suitable for windy and rainy conditions. This may be a dome tent but inside it is still spacious and comfortable. It has a height of 6ft in the center, meaning it is easy to move around inside without having to stoop too much, if at all. One thing we liked is the gear loft, lantern hook and pockets to help you make the most of the space. This tent is reliable in wet weather. It is made from water-repellent material which should keep you dry in all but the most adverse of conditions. The polyester rainfly is removable and the tent features and mesh ceiling for extra ventilation, making it a good choice in warmer weather too. On the downside, this tent is not as durable as something like the Browning cabin tent. While this is much lighter, if you don’t take care of it, you might find it won’t last as long. Another minor irritation is that, without the rainfly on, there are no flaps on the side windows and people can see in. Instant tents have been developed in the last few years to help people who don’t want to waste time pitching their tent. Often, instant tents are smaller models, but this version from Core is perfect for those who want the ease and practicality of an instant tent in a family-sized model. The key feature here is the instant setup. After a few goes, you should be able to pitch this tent in a matter of only about a minute; packing up is just as simple and almost as fast. However, this tent is not just a gimmick and it performs as well as some regular tents in other areas too. It is a cabin-style tent with a huge 6’6” height in the center, meaning only the tallest of campers will need to stoop when moving around. Inside, the tent features room dividers for extra privacy. You could squeeze in nine cozy campers – but it is more comfortable with two queen-sized mattresses. A problem of instant tents in general is that they seem to be more suited to summer camping. This is not a tent designed for sleeping out in low temperatures. It is also not a particularly rugged model and may suffer from rough treatment or from use in poor weather. 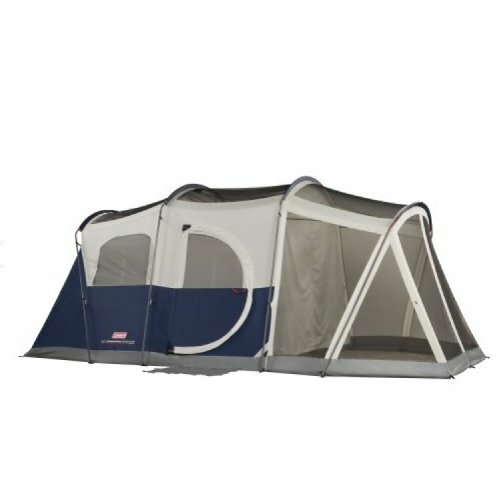 If you need a family-sized tent but don’t want to spend the big bucks, this could be a great option. It is sold as a six-person tent, but it can sleep a family of four more comfortably. It is a dome-style model and is more suitable for sleeping rather than as a general living space. This is a great no-frills tent that would be ideal for family trips into the great outdoors. It’s not heavy, so it’s easy to transport. It’s quick and easy to pitch, meaning you don’t need to worry about spending ages preparing your tent while the kids are getting bored. It’s made by Coleman, one of the most trusted tent makers in America, and it comes at an extremely reasonable price, meaning just about anybody can afford family trips close to nature. It is a dome-style model and will give you somewhere comfortable and protected to sleep at night. This is one of the smaller tents on our list. It wouldn’t be so suitable for larger groups – you could fit six adults in, but it would be very intimate. This is not designed as a tent for cooking or storing lots of gear inside, it is really only meant for sleeping and storing the essentials. This is another great budget option, this time for someone looking for a larger model. This is sold as a cabin tent, although it looks much more like a dome tent – but in any case, this budget option will give you enough space to store gear and move around as well as just to sleep. There are several features in this tent that we really liked. As a larger tent that could be shared by more than one family, we appreciated the privacy options. There are two room dividers, meaning you can have three rooms – and each room has its own private door. It is spacious inside and could accommodate up to three queen-sized mattresses, meaning at least six people could share the tent comfortably with lots of space to spare. Another positive is the windows – there is plenty of scope for ventilation or viewing as required. On the downside, at this price point, it is obvious that the quality of this tent is not the same as more expensive models. If you want a durable tent built to last, you should expect to pay at least a hundred or so dollars more. It is also not suitable for more challenging weather conditions. 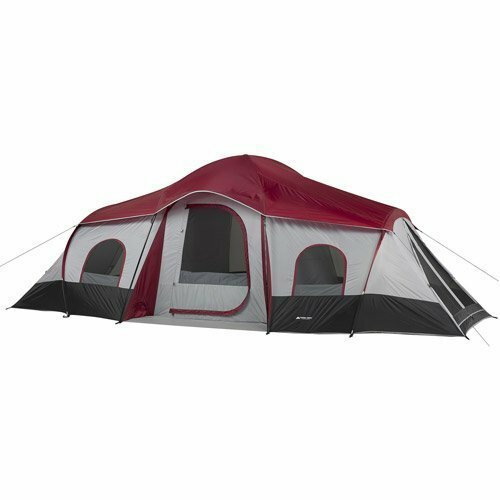 This monster of a tent is perfect or larger groups – this would be a good option for extended family gatherings or camping trips for several families together. Big enough to sleep up to 16 people at a pinch – but more comfortable for up to 12 or 14. If you are considering buying this tent, you will be looking for something big – in which case you won’t be disappointed since this is huge. The height in the center is 7ft, making it easy and comfortable to move about inside. For such a large tent, it’s also very easy to pitch; the poles are color-coded to facilitate setup. It is great for warm or cool weather, and the polyester fly and polyethylene floor will help keep you dry in wet conditions. If you are planning to camp in more challenging conditions, you would probably be better choosing something smaller. Such large tents as this are not designed for too much wind or rain. It is rated as three-season, so is also not good for the cold. Being so big, it’s very bulky to transport if you don’t really need this much space. Some people might say this is a gimmick – you don’t really need things like built-in lighting in a tent. However, if you are looking for a little more luxury and comfort in your family tent, this might be ideal. It is rated as six-person, so would be comfortable for a family of four. 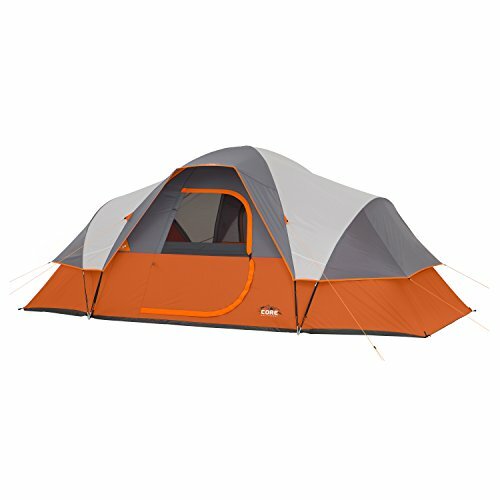 While purists might disagree, we love the extra luxury features you’ll find in this tent. It has a built-in LED light with three modes, so you can see what you’re doing at night and also features a hinged door more like what you would find at home. It is designed to keep you dry in wet weather, but when it’s not raining, you can roll up the sides and even the roof, giving you an all-around view of the scenery as well as the stars above. There is also a “screen room” where you can hide away when the bugs begin to bite. This tent is not perfect, however. It does take quite a while to assemble, longer than some other simpler models. Attaching the rainfly without help is also challenging and is best done with somebody else. Another gripe would be that this tent is not a top-performer in heavy rain. When buying any kind of outdoor equipment, you should always consider exactly what it will be used for. If you are thinking about buying a family tent, things like how many people it will sleep, the camping conditions, how often it will be used, and so on should all be taken into consideration. There are many different types of tent, but large tents essentially come in two forms, dome or cabin. Dome tents are usually quicker and easier to pitch and resist adverse weather conditions better than cabin tents. However, they are usually smaller and offer you less living room inside. Cabin tents, on the other hand, are bigger, offering more living space. Many cabin tents are large enough for adults to stand up in and walk around. However, in general, they are bulkier, heavier and more difficult to put up. They perform less well in bad weather, especially strong wind. For larger tents that can sleep more, you will probably need to consider a cabin model since dome tents at the largest end of the scale are less common. Obviously, you should consider how many people the tent needs to sleep. If you have a family of two adults, two kids and a dog, you need a tent adapted to that many people (and animals!). Tents are generally sold according to how many people they sleep – however, a good tip is that you should add two to this number if you want a more comfortable experience. If you buy a four-person tent for four people, it will be very cosy inside; for comfort, better to choose at least a six-person tent. Larger tents usually take longer to put up and weigh more, but if you are camping with kids and not planning to walk very far with the camping equipment, a larger tent can be better. If you are driving to the spot where you are going to pitch your tent, the extra pounds won’t matter – but the extra living room in the tent will make for a much more comfortable and enjoyable outdoor experience. Larger tents also give you extra space for storage. The doors on your tent are an important consideration. With larger tents for more people, perhaps with two families sharing, there is a good chance that people may need to leave the tent during the night to answer the call of nature. In this situation, it is good to have doors that can be opened easily with a minimum of noise. In larger tents, it may be better to have two doors so as not to disturb others sleeping in the tent as you leave. Also, in good weather, doors that roll up can provide good ventilation, another point to remember when choosing. While on the subject of ventilation, this is another important aspect of a tent. If you are likely to be camping in warmer climates, you’ll want a tent with plenty of door and window flaps for ventilation. Bear in mind that the more bodies inside, the warmer it will become. If, on the other hand, you are likely to be camping in cooler areas, you will want to choose a tent that retains heat well. For colder camping, dome tents are usually more suitable. Also worth noting is the fact that, even in cold areas, the tent still needs good ventilation. If you sleep in a tent with poor ventilation in cold weather, the heat from your bodies will turn to condensation, which may lead to clothes and equipment becoming damp. Also related to weather conditions is how well the tent protects you from the rain. No tent is fully waterproof, but some perform much better in rainy conditions. If you are planning to camp in places with a high risk of heavy rain, you should choose a tent accordingly. In general, dome tents offer more protection from the rain. One way of adding extra waterproofing is by using a rainfly. A rainfly is an extra waterproof layer that goes over your tent to prevent the rain from penetrating inside. Some tents are sold with a rainfly; if not, you may choose to buy one separately. Tents are available at a broad range of price points, but you will need to choose one that will stand up to the kind of treatment you will subject it to. You will also want it to last more than just a few camping trips. If you are looking for a tent for occasional camping in benign conditions only once or twice a year, you probably don’t need to spend too much money on the most durable tents available. However, if you plan to use the tent more often and in sometimes more challenging conditions, you will need to spend more money on a stronger model. This is especially true if you hope your tent will last more than just a couple of seasons. Tents with more poles are heavier and take more time to set up compared to tents with fewer poles. The poles themselves can be strong and sturdy or lightweight but more breakable. You need to decide which properties are more valuable to you. If weight is not an important factor because you always drive right to the place where you pitch your tent, strong, heavier metal poles can be fine, and tents like this tend to last a long time. Also, take note of whether the poles are attached in sleeves or clips. Sleeves take longer to set up but are sturdier and firm once in place. 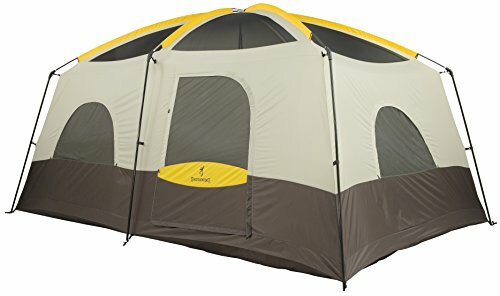 Family tent or small tents? Before buying a large family tent, you should also consider whether that kind is the most suited to your needs. It could be the case that buying two or more smaller tents might well be a better option. Large tents offer more living space, they are more practical for storing equipment and you can even cook and eat inside a large tent if the weather outside is unpleasant. A family tent offers more of a family experience with everybody sharing the same space, and you may find family camping to be more of a shared experience in one large tent. However, there are also arguments for taking smaller tents. If your kids are older, they may prefer to have their own space and privacy. Small tents are lighter and easier to set up, making them a good option if you require more mobility. Another advantage is that small tents retain heat much better than larger tents, making them a better option for colder climates. While family tents will obviously be preferable if you have younger kids who are not old enough to sleep alone, if you are not restricted by this, you should also consider the advantages and disadvantages of camping in smaller tents. Nowadays, there are a lot of large-sized family tents available. Depending on your specific requirements – size, dome or cabin, ruggedness, price and so on – any of the tents on our list could be a good choice. For us, the overall winner, with a combination of value, durability, weather resistance and ease of use, is the Browning cabin tent and we recommend it for your family camping trips – but we would be just as happy to sleep in any of the tents listed in our review. Am I The Parent Of A Child Bully?